You’ll be asked to do this over and over again because self-love is an evolution, not a “one and done” endeavor. There will be glorious moments where you rise to the occasion and gloomy ones where you fall flat on your face (and question what the hell you’re doing in the first place). No matter the outcome, you always resolve to keep going and see just exactly where this adventure takes you. My dear Braveheart, you have many different tools at your disposal while you’re on this journey -- tools that have the ability to strengthen you and empower you as you bust thru the stories and the obstacles that appear on your path. One of these life-changing tools is your self-talk. What is self-talk? Self-talk is mental chatter created by that voice in your head that talks to you as you go about your day. It’s your thinking voice. Your self-talk is powerful because it helps you process life as it happens to you. It helps you to form opinions, ideas, expectations and recommendations about what’s happening to you. It helps you decide small stuff like where to have lunch and it helps you interpret what your boyfriend meant when he dropped you off at your house after ya’lls date. Self-talk is powerful because it affects every single thing that you do and say. What you do and say affects your results. Your results become your life. In short, you can directly impact where you life is by how you’re talking to yourself. Many of my clients share with me that they are their own worst critics and that they say nasty things to themselves (things they would never say to another person and things they’d be so embarrassed about if anyone were to find out). I totally get it because I’ve been there. I am my own worst critic and I know how to make myself feel down in the dumps. Our self-talk is powerful and instead of using it to belittle ourselves, we can totally use it to uplift and empower ourselves. 1. Get to know your self-talk. Real talk, HB: you cannot change something you aren’t aware of or that you don’t know intimately. Your self-talk currently has a very specific way of speaking to you. I bet you that your self-talk uses the same phrases, names and themes every single time that it voices an opinion. Some of these phrases, names and themes you picked up from other people (like your parents, siblings, teachers, friends, etc), so they don’t even really belong to you. In my e-course, Yes, I Am: Affirming Your Way Into the Life You Want, I talk about conducting a one-week mind inventory. During this week, you are an auditor that is inspecting the content of your self-talk. You’re looking at patterns, tone, verbiage, themes, names that you call yourself and others, etc. You want to get a feel for the main vibe of your self-talk. Overall, is it positive or does it depress you? Does it belittle you or does it empower you? As you are conducting your internal audit, it’s really easy to get judgmental (judging yourself for judging yourself) and to go further down the rabbit whole of self-talk by saying, “You’re so stupid for judging yourself. No wonder you’re not farther in your life. You always do this crap. I can’t believe it.” That serves no one. 2. Strengthen your focus with meditation. Here’s the deal: just because you think a thought in your mind or your self-talk says something negative about you does NOT mean that you have to follow that thought or self-talk down the rabbit hole of more negative thinking and self-talking. NOPE. I equate it to the clouds in the sky. I don’t know about you, but just because cloud floats by does NOT mean that I have to anchor my attention to it and follow it wherever it goes. In fact, I never do that. I let the clouds float and I go about my business. Yet how often do we entertain a thought just because it pops into our head? We anchor ourselves to it and follow it down the rabbit hole. We work ourselves into a frenzy. Before you know it, we’ve blown up our boyfriend’s phone with a million texts about something he said three months ago when we first started dating. We can’t help ourselves because our mind has been hi-jacked by some mystical negative self-talk fairy that has taken control over our body and mind. Well, boo, the buck stops here. I often say that our superpower is our ability to choose. We choose our thoughts, actions and clothes every single day. We can choose to follow the thought or not. Meditation helps us harness the power of our focus. I liken it to wrangling a toddler, which is something I know all about these days. My daughter is all over the place and is getting into everything. Her latest obsession is the trash can. As you can imagine, I am constantly redirecting her attention elsewhere in order to teach her that the trash can is not a toy. As you meditate, you are training your mind to not engage with the trash can of your negative self-talk. It means that, just like with a toddler, you are redirecting your focus, so that you don’t frequent negative rabbit holes anymore. Not sure where to begin? 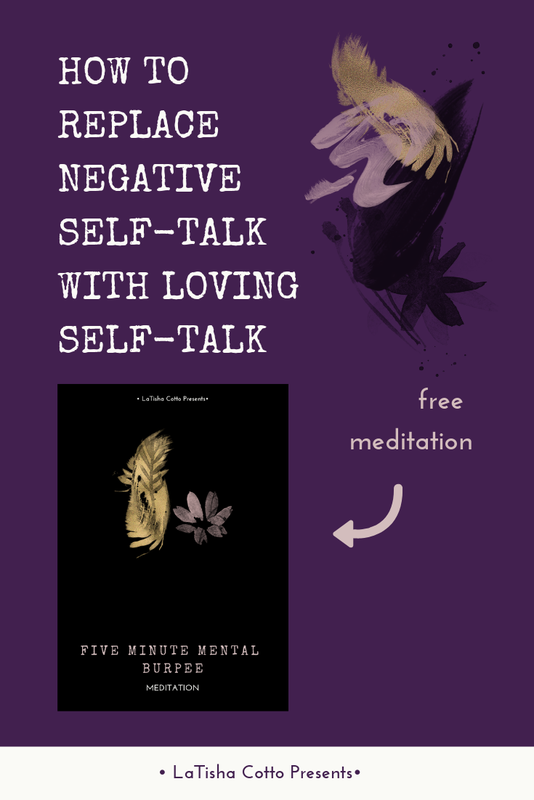 Click HERE to download the free five meditation that accompanies this blog post. Commit to doing this meditation either right when you wake up or before you go to bed every single day for 40 continuous days. 3. Switch to manual talk. One of the reasons why negative self-talk is so powerful is because it’s mainly on cruise control. You aren’t consciously thinking negative stuff most of the time. It literally pops into your head and hi-jacks your outlook before you even realize it. It’s time to override the autopilot and switch to manual talk. Honey Bunny, your self-talk matters because literally every single cell in your body is eavesdropping on your entire internal dialogue. You have neurotransmitters located all over your body that transmit information to and from the brain. So when you’re constantly bashing yourself internally, your cells are soaking up that negative energy. That’s a recipe for dis-ease and disaster. You are more powerful than you give yourself credit for. It’s time to use that power in your self-love journey. You are worthy of love and it always starts with you. Now it’s your turn. Comment below with three of your most powerful affirmations. 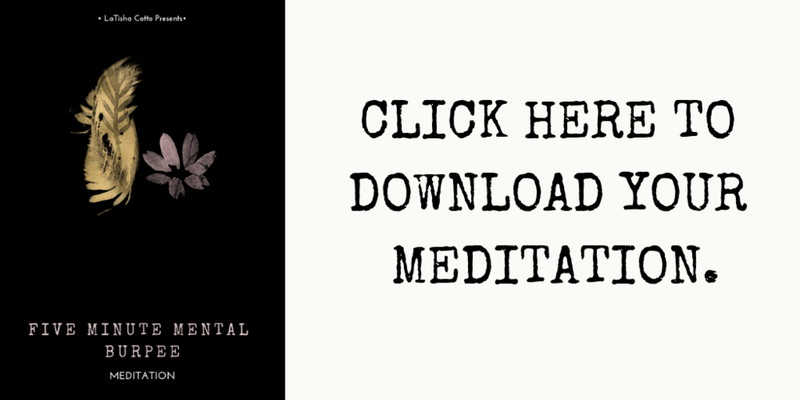 Don’t forget to download my free five minute meditation. I’m cheering for you. Like I’m Athena and you’re Odysseus. P/S Don’t forget to download your free five minute mental burpee meditation HERE.